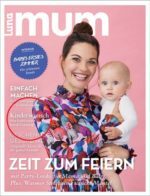 It was nice for Orit to take a break from politics and publish an article on social egg freezing in the 2018 Winter edition of “MUM” magazine. Orit takes a personal look into the process of “oocyte preservation” by which single and married women can freeze their eggs and preserve fertility while they still look for Mr. Right and pursue their dreams. The article is not available online. MUM can be purchased in bookstores and magazine stands in Germany, Switzerland, Italy and Spain.